DogFest - "Give a Dog a Job" is a national, signature event for Canine Companions for Independence held in 19 cities across the country each year. We are thrilled to have the opportunity to host DogFest North Idaho for the 2nd year in Sandpoint! DogFest is a family and dog-friendly fun festival with crazy canine games, contests, booths, food, music and more.... all for the love of dogs! All proceeds raised go to Canine Companions for Independence and their mission of providing highly skilled Assistance Dogs to men, women, children and veterans with disabilities, free of charge. Canine Companions is the largest and most respected, true, Assistance dog organization in the country and has placed over 6,000 dogs to people with physical and developmental disabilities all a no cost. 2 EVENT CHAIRS NEEDED - "Volunteer Recruitment Chair" and "Participant RecruitmentChair"
Volunteer Recruitment Chair - recruits volunteers for all aspects of the event, from set up; take down; and event day activities. If you love people and dogs, enjoy "giving-back " to your community, are organized and confident in asking for help for a non-profit with an amazing mission, and...like to have some fun, please consider sharing your time and talents with us! Ideally, you should recruit 2-3 committee members working under your direction. We'll communicate to you what volunteer positions will need to be filled prior to the event. Participant Recruitment Chair: Use your outgoing personality and enthusiasm to "spread the word" about DogFest and Canine Companions. 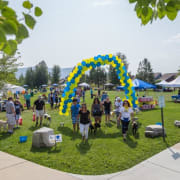 You'll encourage businesses, sponsors, civic groups, church groups, groups of friends, schools and others to help raise funds by forming "TEAMS" on line at cci.org/dogfestnorthidaho. You might think about getting some competition going between groups! Spread the word about this family friendly and fully accessible event right here in Sandpoint and get as many attendees as possible adding to our success. Ideally, you should have 2-3 committee members working under your direction. DogFest is free to attend, but donations are encouraged! Lilly MItsui - Event Chair - DogFest North Idaho "Give a Dog a Job"
Looking for fun, upbeat, enthusiastic people!